The Future is Now: Does Boating and Waterways Need to Evolve? Boating industry needs to modernize to attract a new generation of boaters, commission warns. STATEWIDE — Another new year is upon us and at least one member of the Division of Boating and Waterways Commission hopes the state agency makes the following resolution for 2019: evolve and get with the times so the industry can welcome in a new generation of boaters. Policymakers and industry leaders need to address the future of recreational boating with greater urgency, Division of Boating and Waterways Commission member Virginia Madueño told her colleagues during the agency’s Nov. 14 meeting at Alameda’s City Hall. “Boating is definitely evolving. It’s changing,” Madueño said. Madueño talked about “opportunity zones” in California, previously underserved places identified by the governor to provide private sector investment. Could a boating element be included in these opportunity zones and private sector investments in redevelopment or revitalization? So what, exactly, is the state of boat ownership and millennials? BoatUS, in a 2017 article on the topic, stated only two percent of boat owners were between 20 and 39 years old in 2015 – down from four percent in 2005. The BoatUS article shows boat ownership amongst those aged 20-39 has consistently dropped between 1995 and 2015. Overlooked in these statistics, of course, are those who are members of families who own boats. Who’s to say a 65-year-old boat owner won’t allow his or her son, daughter, niece or nephew – coincidentally in the 20 to 39 age bracket – to access the family yacht. Obviously the younger family member won’t be included in boat owner statistics if there’s a vessel already in the family. The larger question – especially when it comes to demographics – shouldn’t specifically focus on age range, but instead on whether a group of individuals today have the same access (financial, social or otherwise) to boating. Do those who aged 20 to 39 today have the same earning power as those in the same bracket did 10 or 20 years ago? What about slip prices – are rates today significantly higher than when were in the 2000s or 1990s (and adjusted for inflation)? Wait lists are also an issue, right? A recent Facebook thread revealed there’s a three- to five-year wait for some slips at Dana Point Harbor. 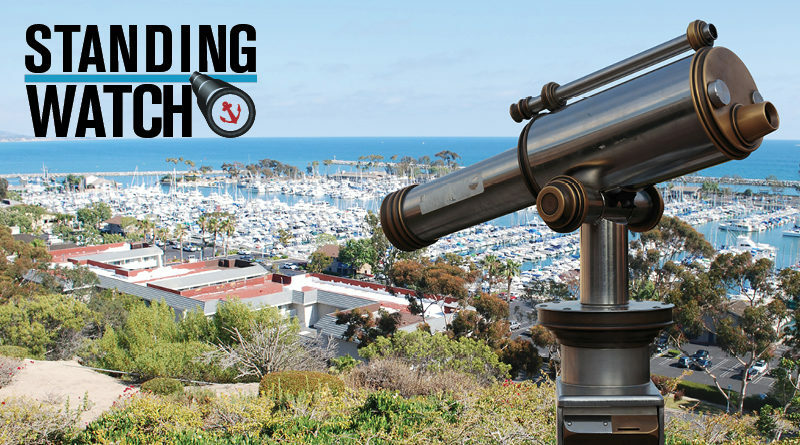 Someone who wants to dock his or her boat at Dana Point Harbor but doesn’t want to wait at least three years (and doesn’t want to trailer it back and forth) might balk at the idea of owning a recreational vessel. Then there are the statistics showing growth within the recreational boating industry. A recent National Marine Manufacturers Association (NMMA) study, for example, reported total recreational boating expenditures for 2017 was at $39 billion – 6.5 percent higher than in 2016. Powerboat sales were up 4.7 percent in 2017 (compared to 2016), as well, according to the NMMA study. Also up in 2017 (as compared to 2016) were sales of new boats, marine engines and accessories. The ability to actually purchase a boat, however, remained the most significant obstacle to boat ownership, according to BoatUS. In addition to the actual cost of buying a boat there are also maintenance, slip, transportation, insurance and fuel costs. “Financial strain came up as the number-one challenge for the young boaters we interviewed,” BoatUS stated in its October 2017 article about millennials and boat ownership. I didn’t know it was that low. The only upside is that at least it may be less crowded out there in the future. Yeah, boats are more expensive and so are slips, when you can find them. Millennials’ job opportunities are far less than for the two previous generations. But fuel, regulatory, tax and operating costs have gone through the roof! I was paying about .70/gallon for diesel fuel in San Pedro back in 1998, when I brought my Hatteras here from Florida. Now, it’s crazy. I couldn’t afford to fill up my 1500 gallon tanks today. What can California’s Division Boating and Waterways Commission do to ensure boating remains a pastime for millions of Americans? The agency, to its credit, appears to be interested in protecting the future of boating. Do you want commissioners, among other policymakers, to go through greater lengths to ensure recreational boating thrives as a regular activity? Staying in regular touch with the commission and giving them your ideas of how they can foster an environment where younger generations of boaters come into the fold is a great starting point. Here is contact information for members of the Division of Boating and Waterways Commission.